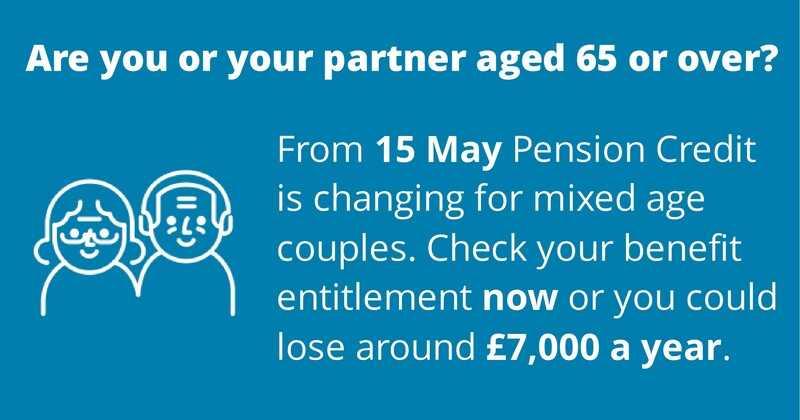 The government's long awaited changes for mixed aged couples, where one is over state pension age and one under, will be in force from 15 May 2019. 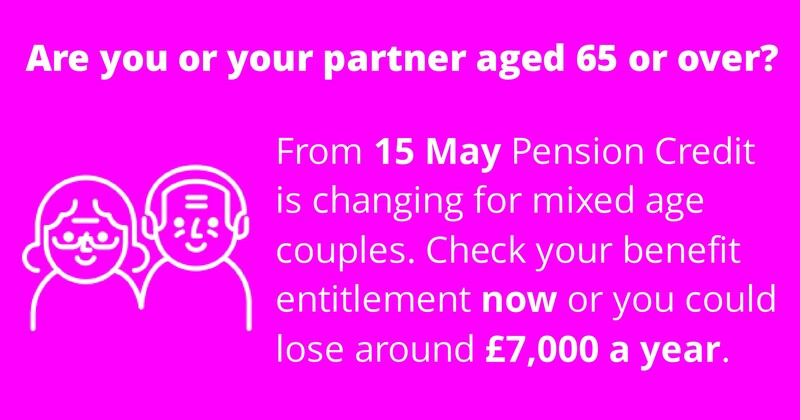 After this date benefits for these couples will be based on the age of the youngest partner, not oldest, costing them around £7,000 a year. 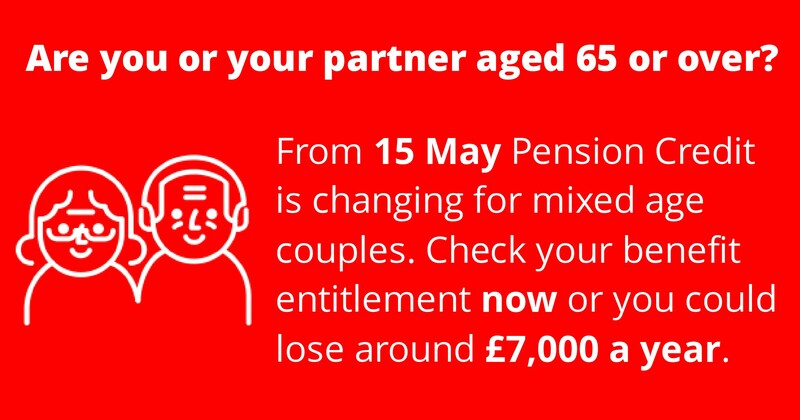 However, if someone applies for Pension Credit in time their income will be protected at the higher amount. It is therefore essential people are encouraged to claim as soon as possible, before it is too late. To help you spread the word about the changes we have put together a range of resources for you to promote the issue to your audience. 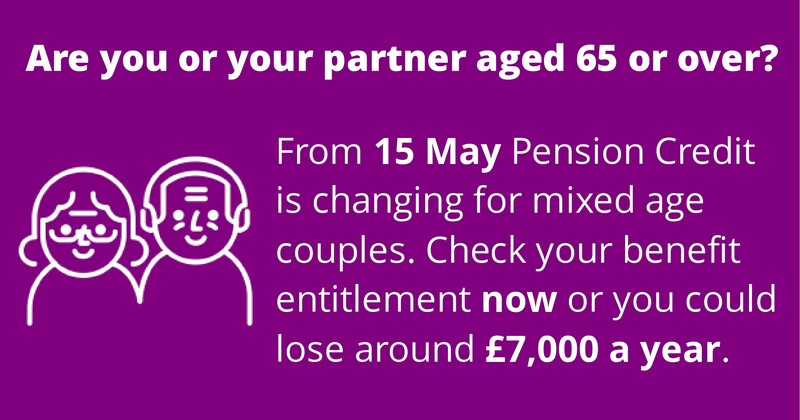 If you need a background to the issue read our mixed age couples blog. Then read on for social media tips, copy for blogs/newsletters/emails, ideas for Housing Associations and Local Authorities and other ways to get involved. Here are a few sample tweets and text for facebook. Feel free to make up your own and merge with the social media images below. Choose which colour image best suits your organisation then just right click and select 'Save picture or image as...'. Sizes are as follows: Portrait banner images 1600px x 2400px. Landscape social media images 2400px x 1260px. If you contact your clients via blogs, newsletters or emails you can use this copy and adapt it for your area or audience. Download suggested copy for contacting your clients. Avoiding rent arrears building up, as can often be the case for Universal Credit (pension age cases can still claiming Housing Benefit). Stop them being affected by the bedroom tax. 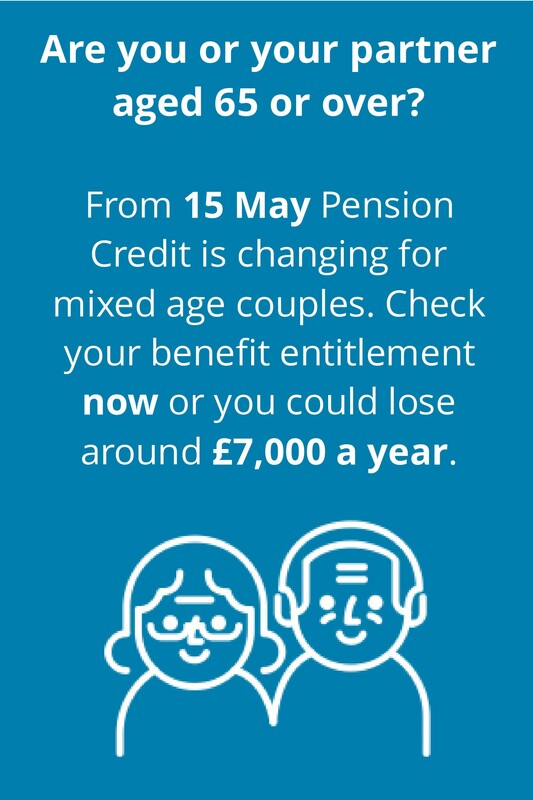 When someone claims Pension Credit they become part of your pension age caseload so are protected from the bedroom tax, benefit cap and council tax support reforms. 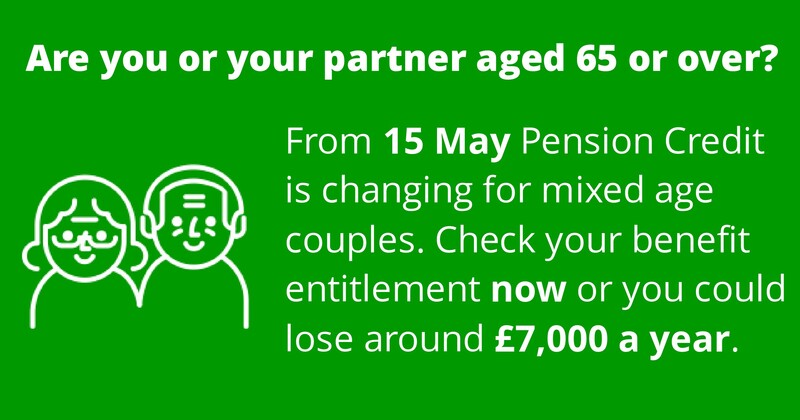 Use your Council Tax Support or SHBE data to contact mixed age couples directly. Send a mailing with your annual billing letters in the next few weeks. Email wendy AT entitledto.co.uk with your success stories and we will shout about them for you. Let Wendy know if you would like any other help writing content for your clients or if you think we can help you in any way.